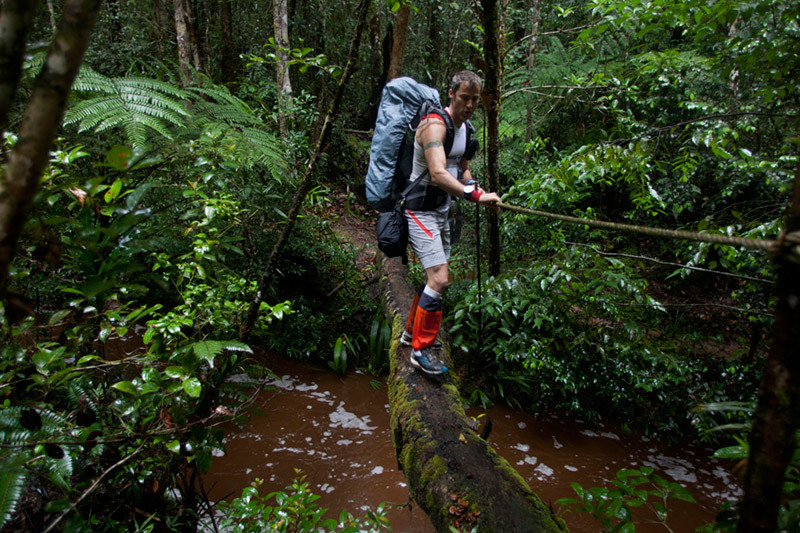 Borneo is one of the largest islands on earth. Weighing in at 748,168 square kilometres, it is the third largest island after Greenland and New Guinea (Australia doesn’t count—it is a Continental landmass—not technically an island). 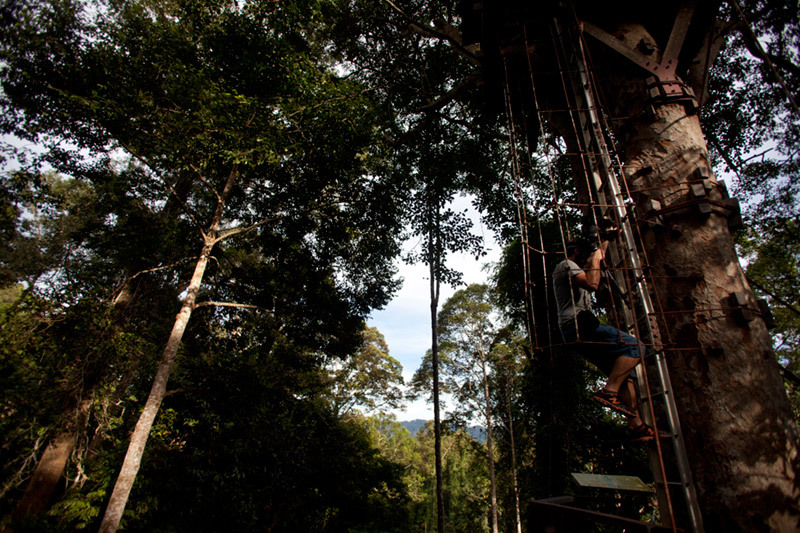 June 2, 2014, 4:38 p.m.
You’ve climbed the Petronas Towers in Kuala Lumpur, got up close and personal with Orangutans in Borneo, trekked through lush Maliau Basin and explored the epic Gua Nasib Bagus cave system—now what? May 12, 2014, 2:52 p.m.
What’s a Genting Sky Way? Have you ever had one of those dreams where you are slowly floating along, high above the world and looking down on the pretty landscape below? Well, that’s not quite a Sky Way, but the experience is similar nevertheless. April 28, 2014, 4:31 p.m.
Jay-Z's eyes came alive when we pulled over at the mouth of the Kampar River in the small town of Gopeng. A simple wooden hut housed 30 rafts, along with different sizes of paddles, helmets, and lifejackets. 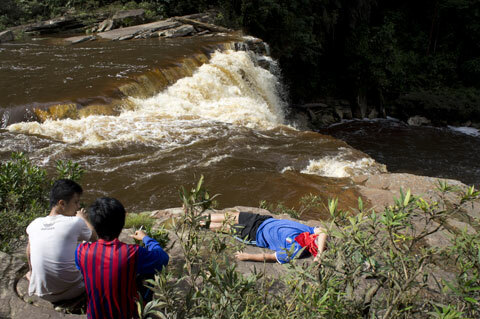 A group of young Malaysian river guides sat around talking and laughing around a small stereo. We could hear the Sungai Kampar rushing wildly off in the distance. It's bounded on both sides by shaggy jungle vegetation, with tree limbs dotting the shores and low-hanging branches gently grazing the dark green water. The river also has nine sets of rapids ranging in difficulty, and as we outfitted ourselves in the hut, Jay-Z laughed maniacally about his big plans to flip our raft and “make things interesting.” Will, a lifelong kayaker, commented that every single river guide around the world seems to delight in these devious intentions. We dragged the raft down to the water and climbed in. The water swirled gently around our boat at first, beckoning us further into the river. But things picked up fast, and we were suddenly approaching our first set of rapids before I could think through what to do. All my paddling has been in canoes and kayaks, and rafting is a whole other centre of gravity, especially because you're perched so high up on the big inflatable sides. Jay-Z shouted paddle commands, and we moved as a unit through the rush. Abruptly, the water spit us out into calmer waters. We'd made it through. So far. I was just starting to understand how to read the waters from my lofty seat when we approached another set of rapids, these ones called the Easy Drop. When Jay-Z had mentioned them earlier, I'd gone ahead and assumed that the drop was an easy one. I was deeply wrong: the name refers to the fact that it's easy to drop out of the boat. Four seconds later, my body was flying through the air and I plunged, stunned and confused, into the churning (and thankfully warm) waters. Finding your bearings in the midst of a set of rapids is a really disorienting thing. I knew I had to point my feet down river and position myself to float with the current, but I couldn't discern where the light was, or which way was up. Several seconds later, I could smell rubber directly over my head, and I resurfaced next to the raft in a bit of a daze. Jay-Z's friend, who'd come along for the ride, had also been thrown from the boat in another direction. We pulled ourselves back onto our seats, fished our paddles from the water, laughing and coughing. The river carried us onward. May 15, 2014, 11:39 a.m.
After a groggy breakfast at the hotel, in which we attempted to douse the very depths of our souls in coffee, we met up with our guide, Pannir, who was waiting to take us up into Tapah. We got in the van and headed north as the day's first bursts of sunlight spread slowly across the highway. It was a beautiful, serene drive, with massive white limestone caves out one window, and dark, mysterious jungle out the other. We arrived at Gua Tempurung, a cluster of tremendous, imposing caves. The word “gua” means cave in Malay, and “tempurung” translates into “coconut shell.” From behind a rusty metal entrance gate, a dull orange light caught my eye. This is where our exploration would begin. Our cave guide, a small, nimble Malaysian guy inexplicably named Jay-Z, tossed Will and I a couple of miner's helmets and headlamps, and we stepped inside. The formations that greeted us were absolutely unreal. All around us, the white limestone walls sloped and spiked dramatically, carved and cultivated by thousands of years of ocean waves. Jay-Z encouraged us to find images in the rock, which wasn't hard at all. He used his flashlight to illuminate a gorilla, a jellyfish, and a pregnant lady. Will found Bob Marley, and I saw that shaggy guy from The Muppets. Overhead, bats swooped in and out of our conversation, fluttering and flapping, then suddenly still. 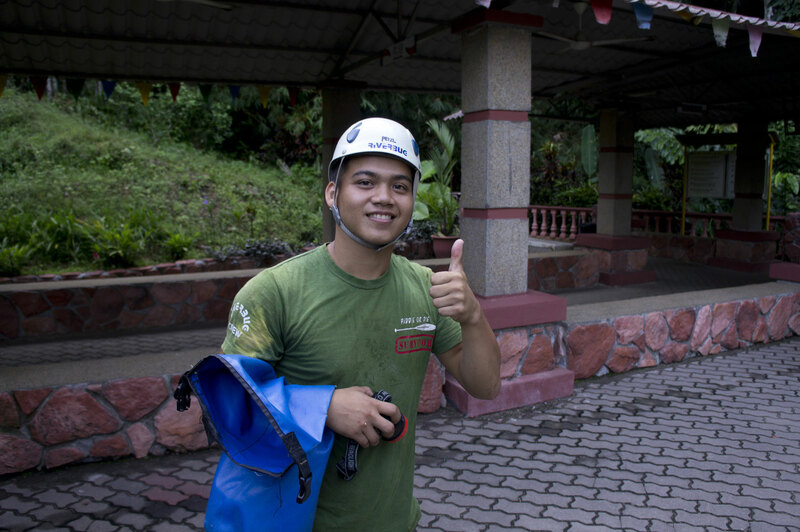 Gradually, the cave exploration became more physically demanding. 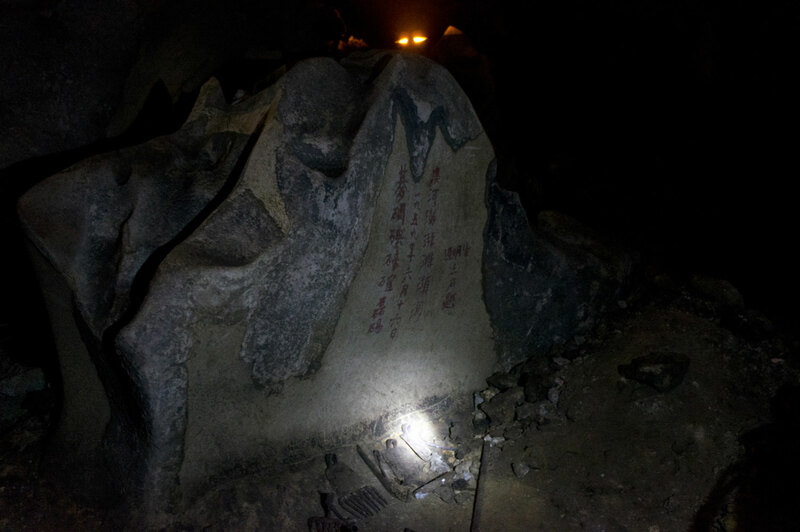 At first, we simply walked with our flashlights, climbing a long series of metal stairs higher and higher into the stalactites. When we couldn't climb any higher, we had to slide down a steep limestone hill, the marble so polished against our quick-dry pants that it was impossible to brake, let alone land gracefully. From there, we shimmied down a tiny black hole and dropped into a cool, knee-deep underground river called the Sungai Gua Tempurung. At this point, we'd gone further than any of the other cave visitors, and now it was just me and Will and Jay-Z, the lapping water, the crunch of pebbles, and the quiet, rhythmic plonk of dripping stalactites. We spent about one hour swimming through the cave. The spaces darkened and tightened, and often, the only way forward was flat on your belly, walking on your forearms and dragging your body horizontal behind you through the total darkness. 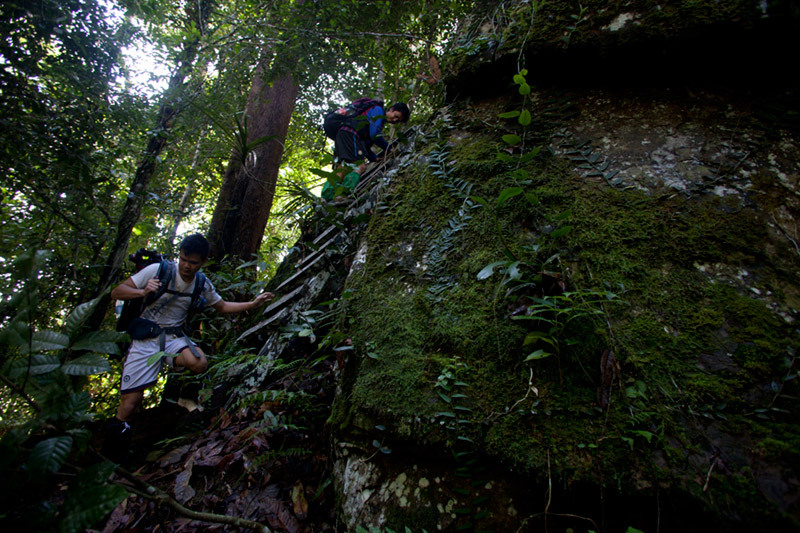 Gua Tempurung is 1.9 kilometres in length, and stands 497 metres high. 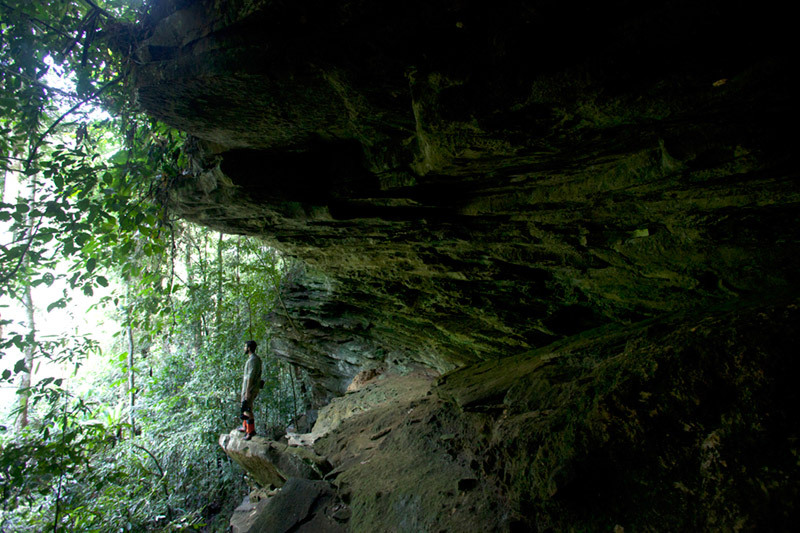 It's biggest cave in Malaysia, and locals used it as a hiding place when the Japanese were invading during World War II. Will and I tried to imagine what it must have felt like back then, a time long before the routes in and out of the cave had been established, and before our powerful headlamps with beams that can cut through any uncertainty. We passed several makeshift gravestones as we swam and waded and crawled. Eventually, we washed up in a burst of daylight, and the cave's ceiling sloped gently upwards, once again becoming high enough for us to wade out toward the trees. May 14, 2014, 11:32 a.m. I meet Will for the first time in the airport—he's the only other person frustratedly trying to use an automatic check-in computer at 1 am. Our flight stretches endlessly across the sky, as Thursday stretches into Friday, which stretches into Saturday. Having flown to Malaysia not too long ago, I'm familiar with this strange species of SuperDay. You eat a meal, not really knowing which meal it is. Pasta for breakfast, the day's the night. You're awake forever. I re-watch the entire first season of The Office (British version), which is still deeply fantastic. In my room at KL's Furama Bukit Bintang hotel, the muggy tropical air battles with the air conditioner. I feel the cool chugging and churning and trying its best, but the humidity is winning. This is not a bad thing—it's a really good smell. Earthy and grateful, it hangs heavy from the minute you step off the plane. It reminds you where you are. After a few hours of deep, industrial-strength sleep, I wake up confused at 4 am. I lie in bed listening to honking horns on the roundabout outside my window, curious where all those KLers are rushing off to at this unlikely time of night. I find a weird Malaysian channel devoted to scooter races, and take my first Malarone with a swig of sealed bottled water. May 13, 2014, 11:25 a.m.
Back in KL, we celebrated the end of the expedition at an insanely delicious Punjabi restaurant. Later, we found ourselves wandering around the Thean Hou Chinese temple, an ornate, multi-tiered prayer hall with a very open and welcoming vibe, the sounds of the Chinese harp wafting out over the evening traffic. The fusion of the restaurant and the temple created the perfect microcosm of Malaysian culture and a fitting final night on the road. Can we talk seriously for a minute about the aforementioned Punjabi restaurant? Because our experience there was transcendental. The food was out-of-control good, and not only because we'd just emerged from the bush. Mango lassis made with real, unpasteurized yogurt (it's worth noting that the four of us had been lying on our cots at night in the jungle and collectively fantasizing about mango lassis in a serious, serious way). Tandoori, curries, heaping bronze bowls of colourful veggies, and beer. If you find yourself in KL or anywhere remotely near it, get yourself to Jassal's Tandoori Restaurant. Tell him we're still full. Malaysia's a place that's fed and nourished so many different dimensions of our team; it's hard to believe a single country can offer so many distinct worlds. Malaysia gave us the noise and colour of street markets so we could meet people, socialize, chat with locals, and laugh. 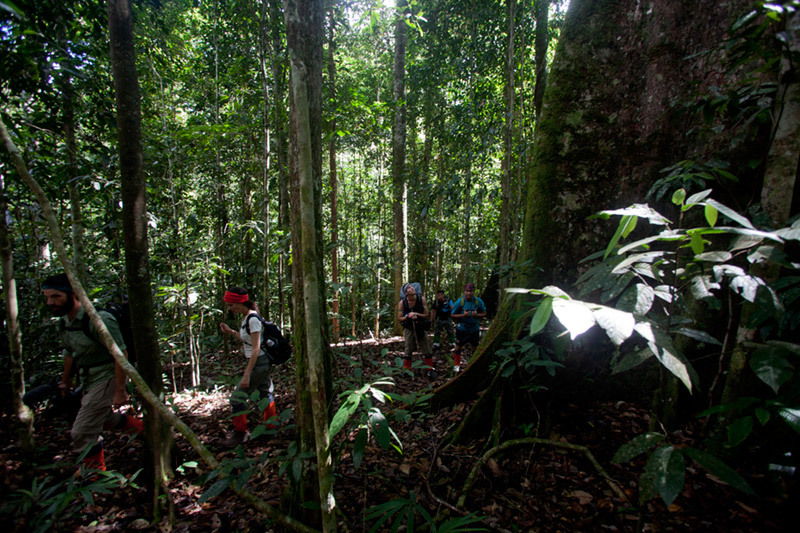 It gave us long, meditative walks through pristine forest so we could be quiet and still. It gave us raw, challenging weather that kept us up all night, and then deep sleeps in modern hotels. The sombre reverence of mosques and temples, and then the feeling of total freedom in a 4x4 Jeep barrelling down an open dirt road under the stars. I suppose you can unearth these contrasts in any country -- but only if you're game to keep moving rather than stay in one city, one town, or one resort the whole time. The past three weeks have been a good reminder of that; Paris is not France. Toronto is not Canada. 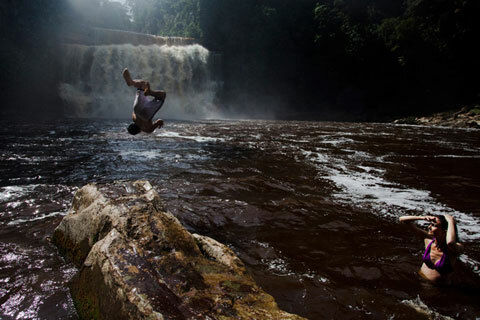 We covered a whole lot of ground on our Malaysian expedition -- logged hours driving through the country and trekking through the wilderness -- and we were rewarded immensely with a vast galaxy of different experiences, vibes, activities, and flavours. Jan. 20, 2014, 2:55 p.m. I imagine most travellers experience the same disorienting and wonderful feeling I'm having of being in two vastly different places on the same day. 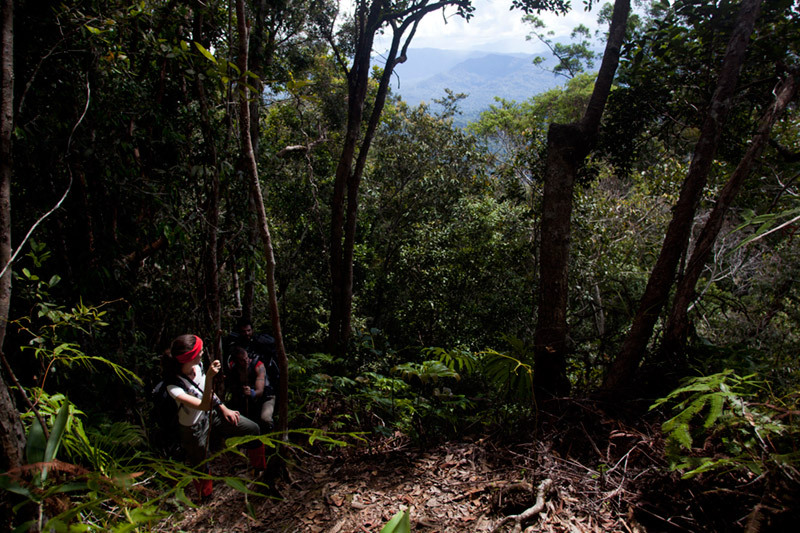 This morning, I woke at 5 a.m. to a cacophony of jungle sounds deep in the Maliau Basin. By evening, I was swimming in the ocean off the coast of Kota Kinabalu, the dark clouds painted by the final light of sunset. 4 days hiking through slick mud, doing battle with tenacious leeches, and splashing through rivers teaches you some things. First off: pack light, which I didn't do, and I paid dearly for it, particularly on the steep ascents, where my heart pounded like a baseball bat against my ribs. For all the clothes I carried, I really only needed one pair of pants/shorts/socks for hiking and one change of clothes for camp (each morning required a minor psyche-up to put on wet smelly clothes). Another piece of the puzzle was working with the humidity. I'd read a bunch of photography blogs about the dire issue and loaded up on 100 or so silica packs, which would help absorb the humidity gathering around my camera gear. In the end, though, the jungle won, and the silica packs were rendered wet mush. 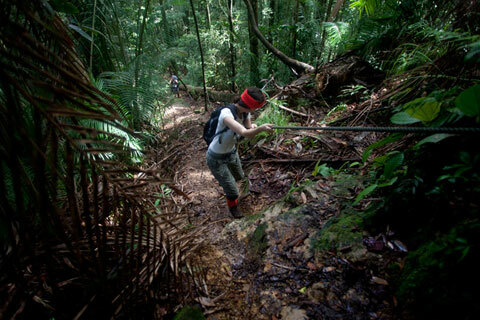 Hiking out of Ginseng Camp yesterday, the path was wet and steep in sections. Slipping and sliding downhill, we used trees for support. I always tried to make sure there were no poisonous creatures where I put my hand, but I couldn't always be sure. In the end, falling off a ledge seemed to pose a more imminent danger than being bitten by an unseen jungle critter. 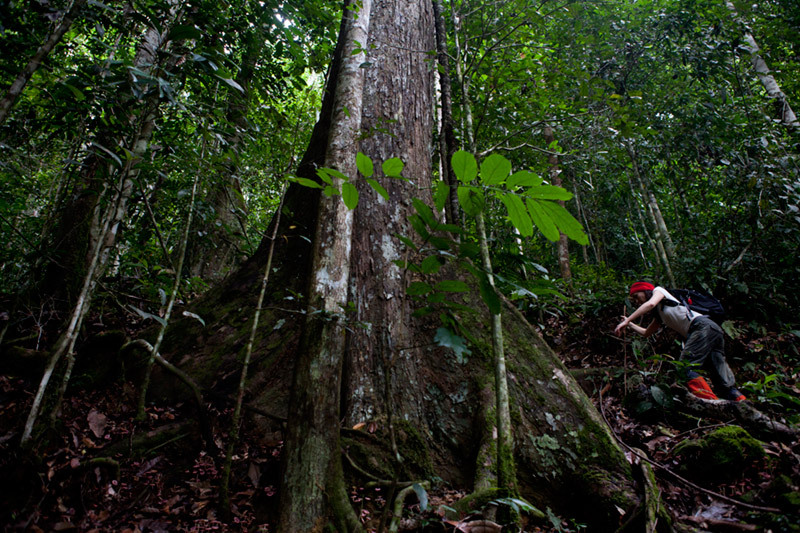 Walking beneath the forest canopy, the sun splintering through the trees, I was keenly aware that I may never be back to the Maliau Basin, so I tried to be a human camera to absorb every aspect of the experience. Of course, that sense of appreciation instantly vanished when I slipped on a muddy downhill and the weight of my bag tossed me and my head into a tree. My mood took a dark turn, until I began recalling all the funny moments I'd shared with the Outpost crew over the last two weeks. Soon I was laughing uncontrollably. This morning, we made the 4x4 trip out of the basin. We saw the dung of the elusive jungle elephant but sadly no sightings. Ditto for monkeys. 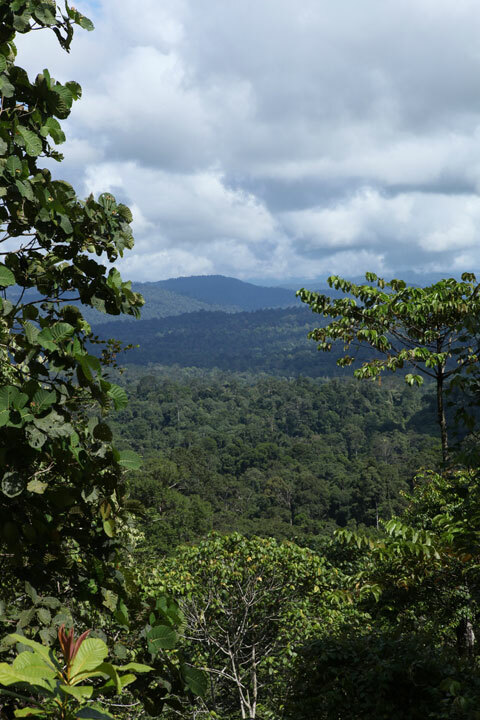 But, in the end, I was just happy to know that a reserve like the Maliau Basin existed and that the animals had a place to roam free. 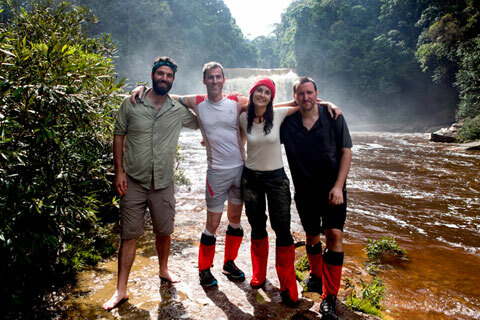 Jan. 13, 2014, 1:45 p.m.
All week, I've been hiking alongside these three guys, under lazy treetop canopies, through the hooting calls of the gibbons, across rushing waters and questionable bridges, the flash of their orange leech socks a constant flicker in my periphery. But today I really felt our cohesion as a team crystallize, take shape, define itself in a quietly effortless and wonderful way. You head into a trip like this unsure of what problems you'll encounter and how your four respective skill sets will merge to solve them. Today, as we embarked on the 10k trek back to Agathis Camp, I felt the unique energy of our team perfectly fused and steadily pulsing. Usually we talk as we walk. We talk about other parts of the world we've explored, how we grew up and how we're still trying, religion, Rob Ford, career frustrations, our families, plans, neuroses, and cravings. 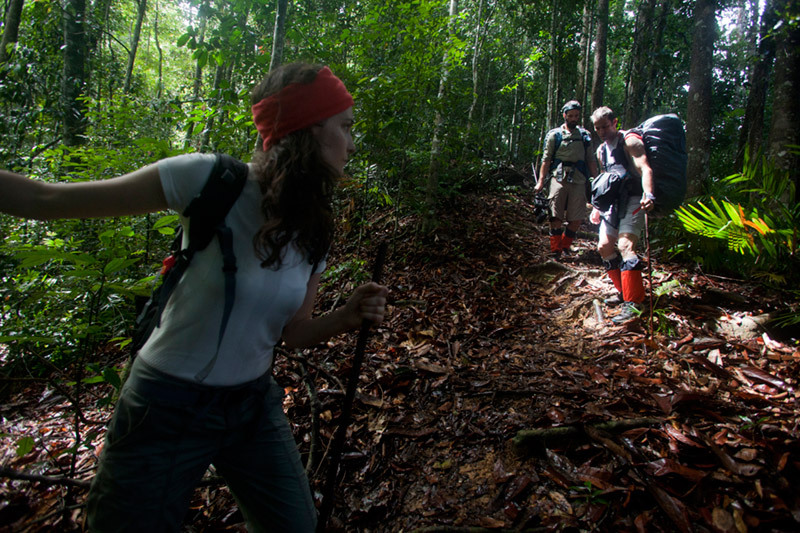 We laugh endlessly and often, like when our guide somehow led us to the exact spot on the jungle floor where the tiniest plant in Borneo “grows”—an absolutely miniscule dot he proudly, inexplicably located in an enormous wild forest the size of Singapore. I know Rob's always ready with a good song to belt out when I feel like music, Colin's the guy to walk with when I want to just breathe it all in and appreciate everything around me, and Andrew's always right there when I notice something weird and ridiculous. I'm grateful that our crazy little team made it out of the jungle and a pulled muscle was the biggest problem we faced along the way. But now that I know us better, I'm not entirely surprised. And so, it was strange and a bit sad to begin the long trek back through the concentric circles that will return us to our lives; first we hike out of the jungle, then back to the town of Kota Kinabalu, then it's a series of flights: back to Kuala Lumpur, through Hong Kong, and eventually, to Toronto. We made it back to Agathis Camp where we'd had the remarkable foresight last week to put a case of beer in the river to cool it off in time for our triumphant return. 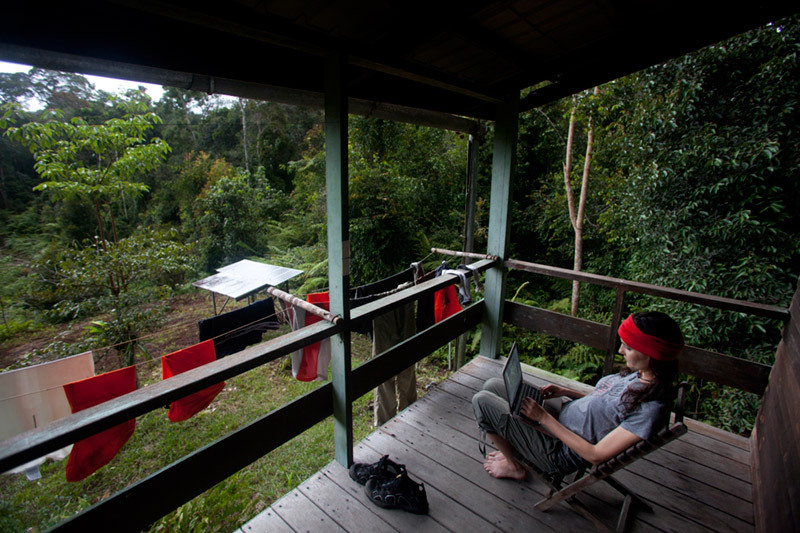 And that was our last night in the beautiful Maliau Basin: sharing beers with Augustine, some tinny tunes from our laptop's tiny speakers, a feast from the forest, a fresh fistful of Band-Aids, and sitting around and talking the sun down. 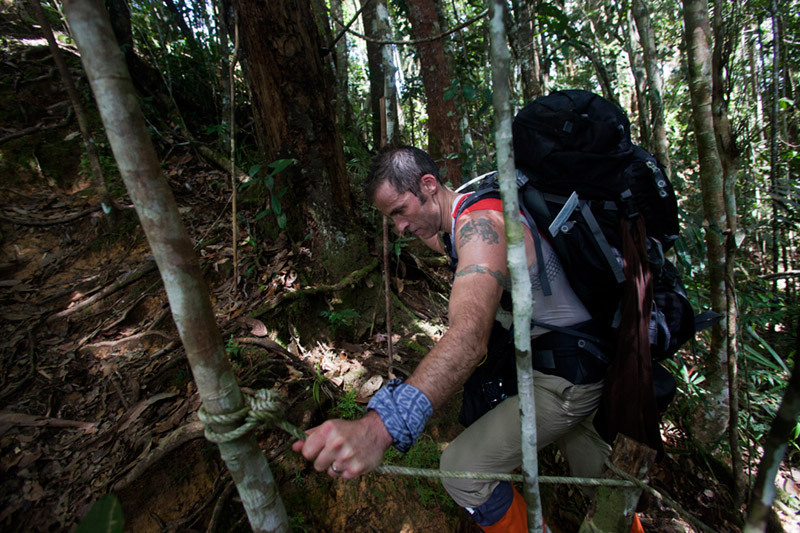 For the record, it did quickly become apparent why we needed a guide on the Maliau Basin trek, and more specifically, Augustine. The man is an enthusiastic, creative, and very talented cook. By contrast, the four of us rolled into camp every nightbleeding, sore, and exhausted. It's not that we needed Augustine to make us beautiful, colourful, and utterly delicious meals every day. But we were endlessly, ravenously grateful that he did. Dec. 30, 2013, 5:37 p.m. The jungle put on quite a show for us today. 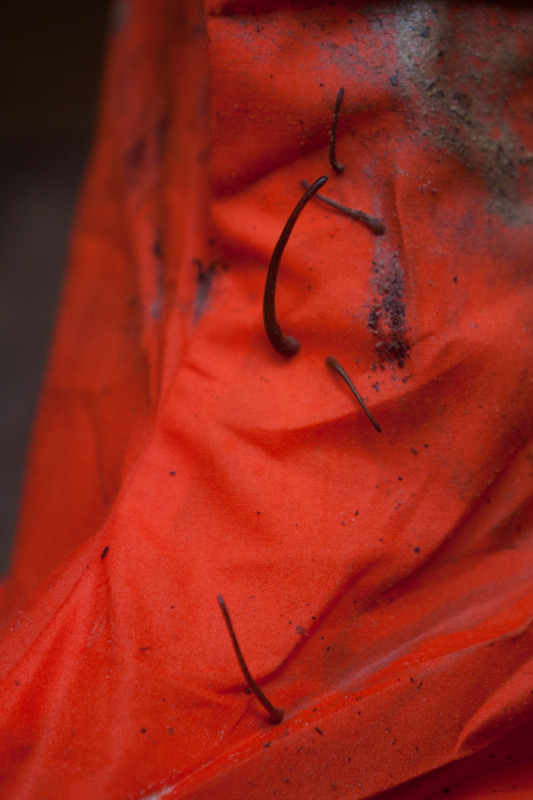 We met with extremes of every kind on the trail, and resurfaced at camp bloodied, bruised, and drenched. Today's mission was a 10k trek from Ginseng Camp out to Maliau Falls and back, the day hike affording us the luxury of leaving our heavy packs on our bunk beds. We set out on the trail in perfect sunlight, the humidity not bad at all (alternatively, we've just gotten used to it). The trek was a lot of extreme uphill and extreme downhill, and we used ropes to rappel ourselves down the more muddy areas. 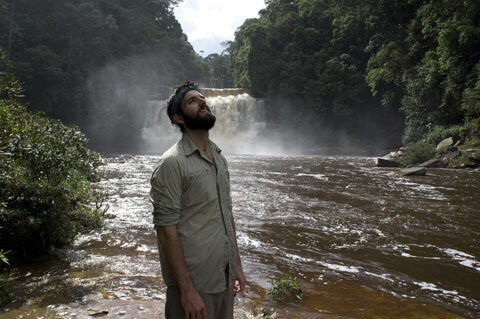 About a kilometre before we reached the falls, we could hear the water rushing loud. 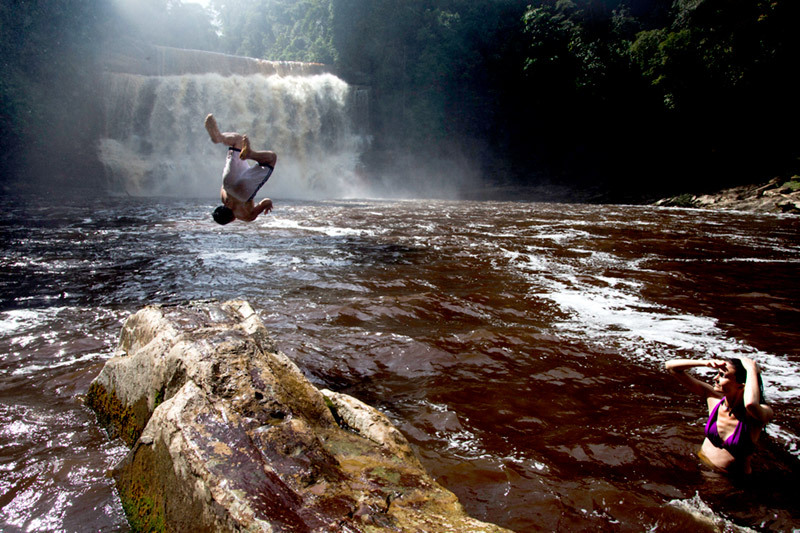 We collapsed onto the shiny wet rocks, scarfed down some fried rice and leaped into the water. When you've been trekking for three days and you've basically become a walking stew of sweat, DEET, sunscreen, and blood, to jump into the cooling, tumbling forest falls is basically to know God. We spent a good long while floating blissfully in the waves, jumping off rocks, and filming parodies of over-the-top sensual rainforest shampoo commercials. By the time we'd dried off and begun the trek back to Ginseng, we could hear the crack of looming thunder getting closer and closer. The downpour came, hard and furious. 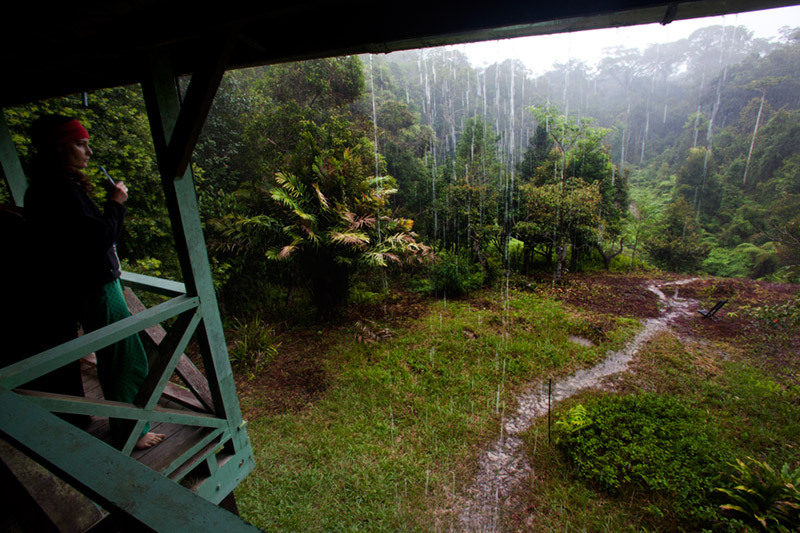 Unlike in the city, where your instinct is to run for cover, in the jungle, the rain is a total gift. It cools you instantly, washes your clothes, soothes your insect bites, and takes you, strangely but surely, back to a simpler time when you played in the rain instead of getting inconvenienced by it. Dec. 30, 2013, 11:22 a.m. The Malay word of the day is "palan palan," meaning slow slow. And that's what we needed to do to navigate our way from Camel Trophy Camp to Ginseng Camp, a mere 6.5km away. 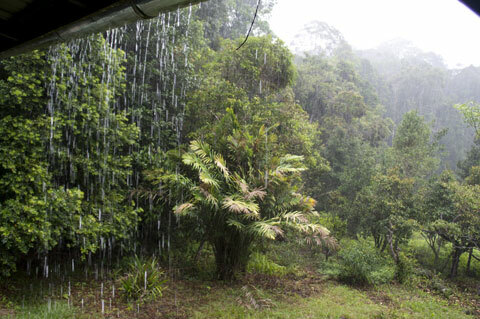 The rain had started last night; the sky opening up and dropping buckets of water. It was relentless. When we were leaving camp at 10am this morning it was still raining (the monsoon rain won the prize for tenacity and commitment). The path had become a full-blown stream. The only way to navigate it was to go straight through. As we hiked, we kept an eye out for each other, looking out for offending leeches trying to breach the barrier of our specially made leech socks. I shudder to think about the blood bath had we not donned our custom made garment. For a time, the rain ceased. We headed down a steep ridge, a treacherous 500 vertical meter descent down mud with slick tree roots criss-crossing our path. 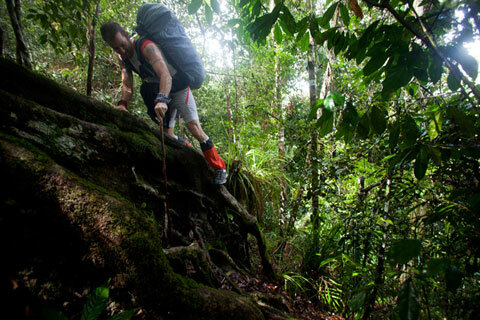 It was fun, but it was also work to stay upright, weighted down by our packs, bracing and swinging from tree to tree like our cousin, the orangutan. We all took our turn losing our balance, laughing as we went. Our reward awaited us at Ginseng camp, which appeared in a clearing like a jungle mirage. Built as a series of elevated structures connected by wooden walkways. I felt temporarily safe from the blood-seeking leeches. I took a bucket shower, shared a meal of spiced rice with my Outpost mates, and lay down for a nap to the sound of the nearby river. Life is good off the grid. The next torrential downpour is TBA. Dec. 16, 2013, 4:21 p.m. It rained last night like the world was ending. Angry, charging rain, the sound like white noise on a '70s television set with the volume cranked to ten. We fell asleep beside it, under it, in it, on a haphazard array of mattresses spread across the floor of our cabin at Camel Trophy camp. None of us slept much, between the deafening sound and the leaky roof. It rained all night and all of this morning. By the time we headed out for Day 2 of our trek, it had been pouring for thirteen hours straight. At first we armed ourselves with rain jackets and gators, but then Andrew gave a deeply moving speech over breakfast about embracing the wet and surrendering to the universe. 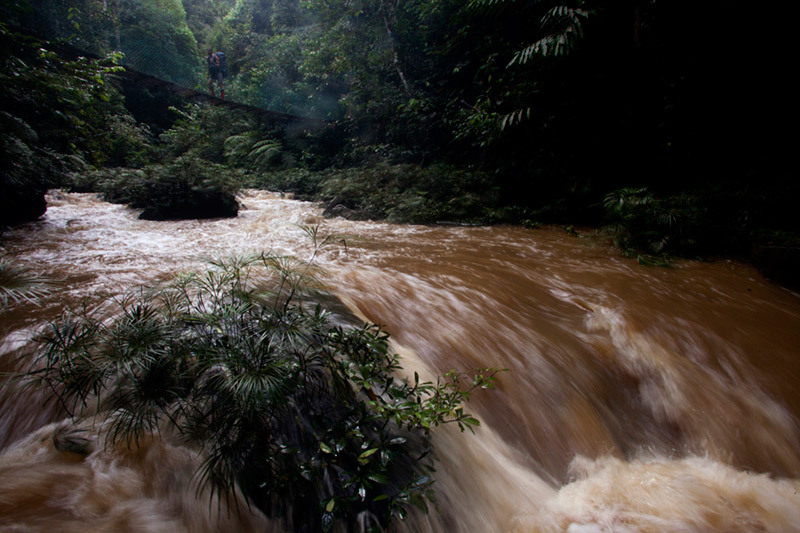 So we headed out in t-shirts, shorts, and our bright orange leech socks and got crazily, happily soaked, just some crazy kids lost in the jungle. Whereas yesterday's trek was a constant uphill climb, today's was near-vertical downhill hiking, made exponentially more treacherous by the slick mud and knee-deep rushing water we had to wade through. 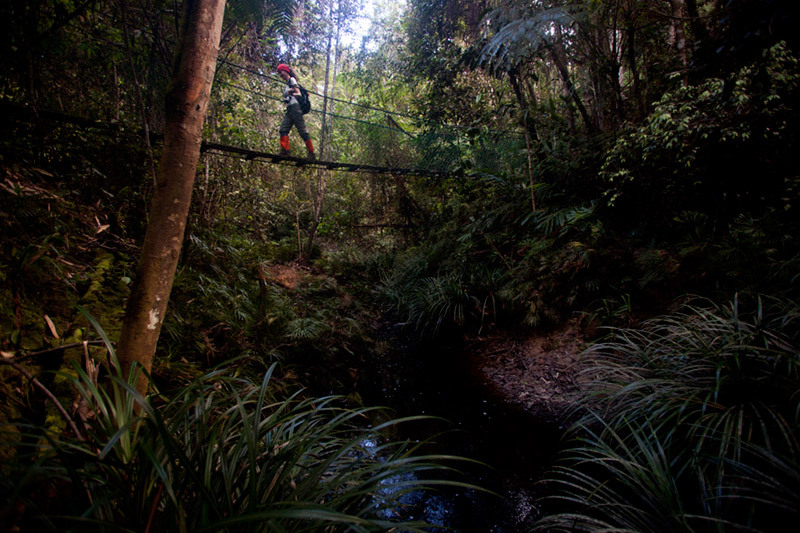 We grasped onto swinging vines, wobbled across rolling logs, and pulled off some inadvertently impressive pole dancing routines around more than a few trees. Several portions of the hike would have made pretty solid footage for one of those Slip 'n Slide commercials from the '90s. We arrived, muddy, scratched, scraped, and hungry, at Ginseng Camp, a sprawling bungalow-style cabin right beside a waterfall. As we hiked, Augustine gathered some jungle plants to incorporate into our dinner—banana bud, wild ginger, and fern—and the plan tonight is a simple stir-fry and a game of euchre by headlamp. This is what I love most every time I go get lost in the wild with good people. The days are filled with simple needs: staying fed, staying hydrated, getting rest, swapping stories, laughing a lot, and looking after each other. Incidentally, we have a leech count going between the four of us. The rules are: it has to bleed, and you can't pull the leech off before Colin has a chance to get an award-winning photo of the blood. You know, for all those Smeared Blood Photo Exhibitions out there. The person with the most bites by the time we leave Borneo has to buy beer for everyone else once we're back in Kuala Lumpur. Dec. 10, 2013, 12:48 p.m. The hike from Agathis Camp to Camel Trophy Camp was tough going—mostly uphill, though the rocks and tree roots created some natural stairs to help us. The hike from Agathis Camp to Camel Trophy Camp was tough going—mostly uphill, though the rocks and tree roots created some natural stairs to help us. The biggest challenge was probably adjusting to the heat and humidity. Only minutes after starting out, your clothing locks you into your own personal steaming sweat lodge—Andrew actually wrung a fistful of his shirt out and we watched it drip to the ground. The heat definitely makes the hike more challenging—you're panting and dousing your head with water the instant any kind of stream presents itself, but I found that the exertion quickly starts to feel really good. Your body is sweating, alive, moving, detoxifying itself. 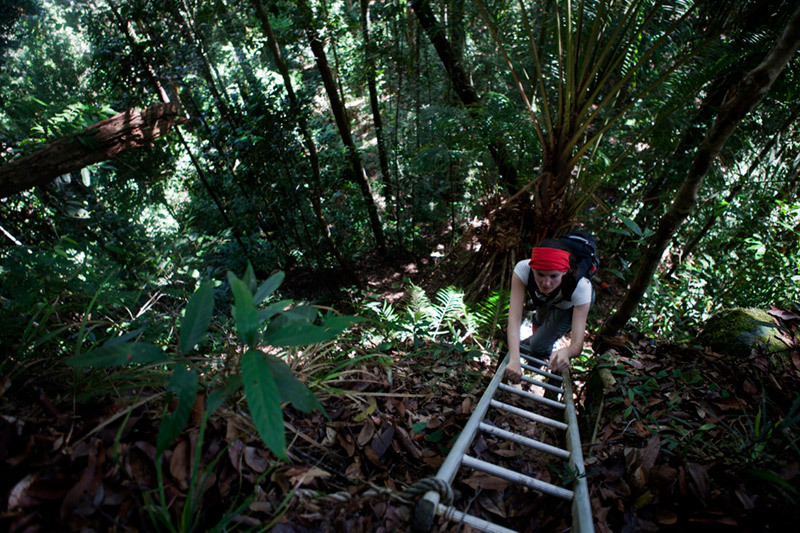 We had a number of rickety aluminium ladders to contend with along the way, but it was a satisfying scramble to the top every time with views that plunged deep down into lush valleys of ancient vegetation. 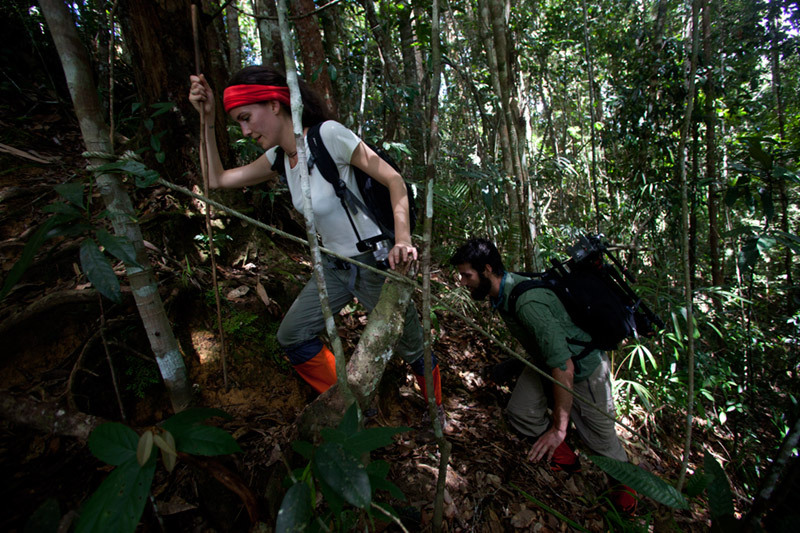 We spotted a few jungle inhabitants along the way—an enormous bright red millipede, an insanely long termite march that circled multiple trees multiple times over, and the occasional flash of elusive birds with soaring wingspans. And then there are the leeches. It's not an exaggeration to say they are EVERYWHERE, their unsettling eyeless faces perking up at the first sign of body heat moving their way. They perch on leaves, slither around the ground, and if you use a tree trunk for 0.1 of a second to steady yourself as you climb, that tree trunk kindly throws in an armful of leeches at no extra charge. 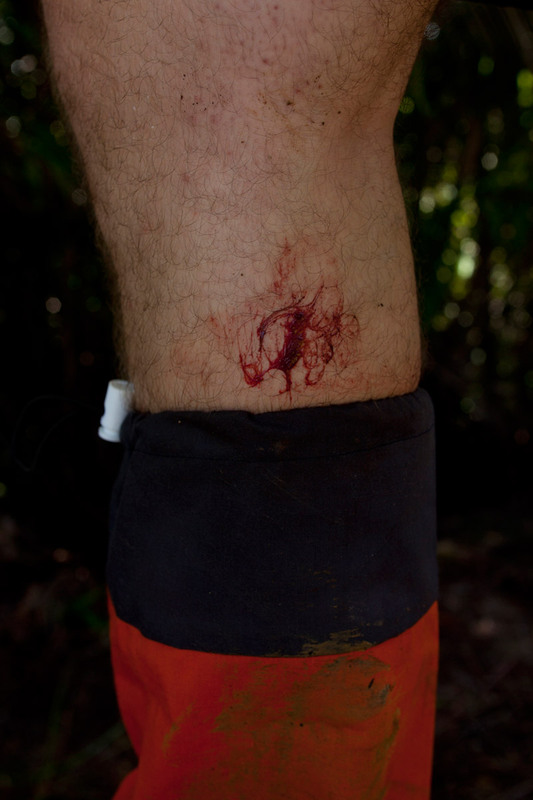 The leeches take some getting used to, because every time someone gets bitten the resulting wound looks insane and way more dramatic than it is—like a gunshot or a stabbing. Between us, we've managed to pinpoint the best moment to flick a leech off your body: it's the extremely small window right after it's landed on your skin, but before it sinks its teeth in—right when it rears its head to fully commit to your flesh. Of course, this involves keeping a near-constant watch on each others' every body part, but with eight eyeballs between us we're doing all right. 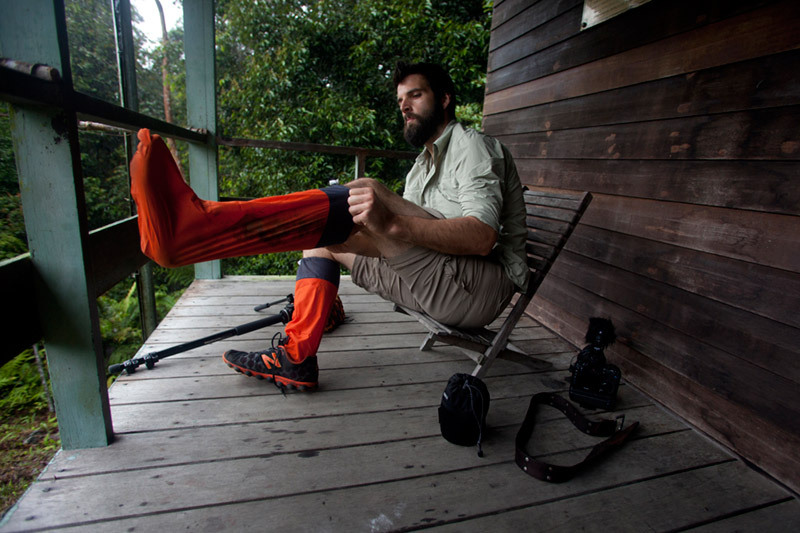 Our bright orange leech-proof socks from Augustine have also been a godsend. We arrived at Camel Trophy Camp just before 4 pm, stripped down to our skivvies, jumped into the river, and now we're sitting on our wooden porch with some fresh mango we picked up at the market in Tawau yesterday. A few minutes ago, a rainbow spread itself across the treetops. Life is pretty perfect right about now. Oh and also there's blood all over every conceivable surface of this cabin. Dec. 2, 2013, 1:53 p.m.